Configurable w/r to the Muxes to be scanned and/or included in the usual set of Muxes being used. "Scan forever" feature, interesting for DX-ers wishing to observe Muxes over a longer time, particularly together with TII logging. Selectable waiting time after recognition of a Mux, for TII logging. TII Recorder: File structure improved, now directly importable into Excel, with TAB as separator. Audio Recorder (DAB+ only): Format selectable between WAV (as usual) and pure AAC (with ADTS headers). The latter allows for high-quality recordings compressed by at least a factor of 10 compared to WAV. The popular Foobar2000 app is able to play these files. Not seekable yet though, because embedding in a suitable container is not yet implemented. Indication of the correlation peaks used for the "FFT Window" determination in the CIR spectrum. 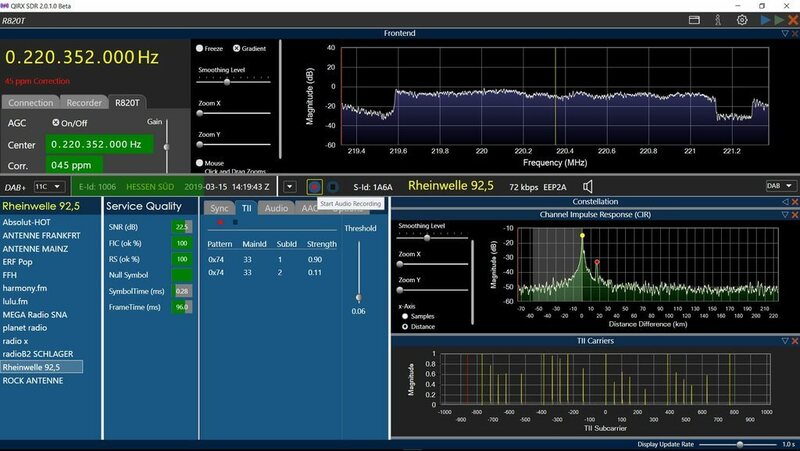 AirSpy compatibility ? solution ? Tnx! As an Introductory Story, if I know what the author is talking about, why bother reading it? I thought I would broaden my Knowledge Base; the author took a whole lot for granted in writing his work,,,for him/her-self. Sorry if the terms are not understandable for you. On our website softsyst.com/qirx you might find the explanations you are missing. If not, please feel free to email to me: info (at) softsyst.com. I will be happy trying to answer all of your questions.